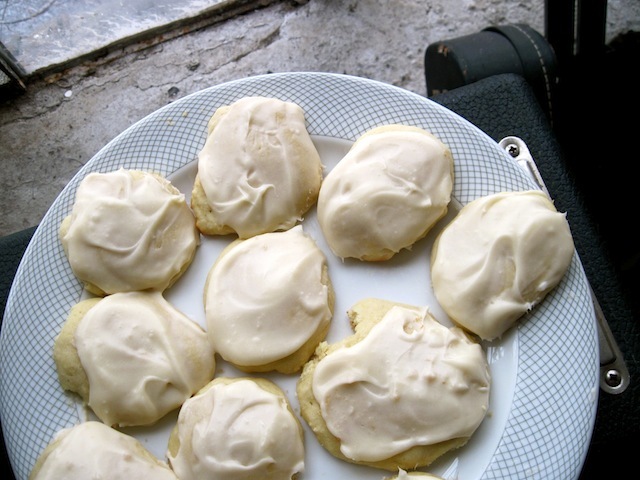 Buttermilk in Your Eye is Not Pleasant, but Buttermilk Cookies Are Awesome: Buttermilk Cookies – Eat Me. Drink Me. Josh, you have inspired me to bake. Well, Josh, it’s a toss-up between you and the barely used carton of buttermilk in the fridge. (Remember those deep-fried eggs?…) I feel like buttermilk often has this effect on people. This project was miraculous for two reasons. One: I don’t bake. And two: I did my dirty dishes right after cooking. As for the first reason, I simply find that my temperament is not suited to baking. 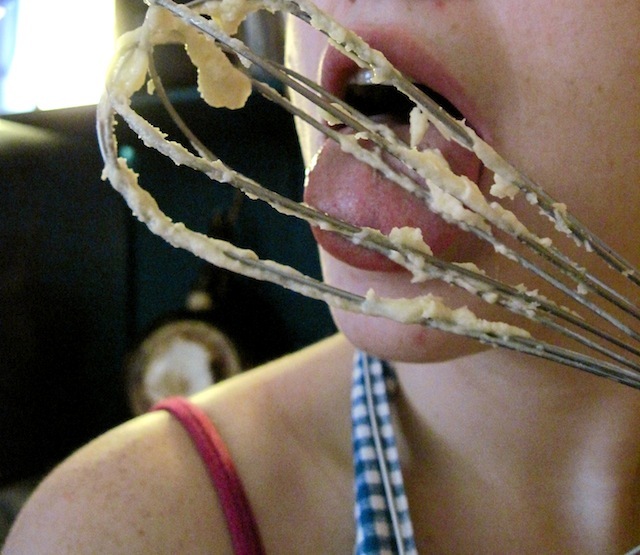 Baking is too mathematical, precise, and often unforgiving. I don’t even own a set of measuring spoons. And I cook very much by trial and error. And I am extremely bad at reading recipes. As for the second, that is probably truly the miracle. 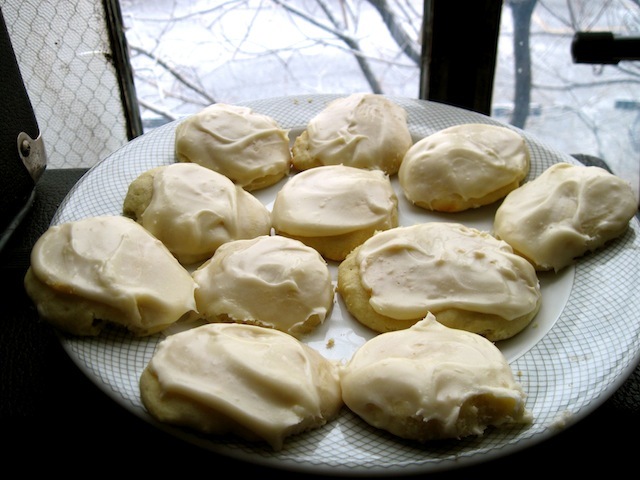 My friend Brittany (or rather, Brittany’s mom) used to make these buttermilk cookies around Christmas time (I think – it was back in high school), and they were the best cookies ever. I finally asked for the recipe when we were about to graduate, then managed to make them – never. Lucky for me and the buttermilk in the fridge, I had just been looking through my recipe collection and had just those cookies in the back of my mind. As with the measuring spoons, I don’t own a handheld mixer. So I creamed butter, eggs, and sugar by hand. Josh, here you were again inspiring. I discovered, after I got this far, that I didn’t have any flour. So, leaving my pre-pubescent dough on the counter, I threw on a coat and some boots over my pajamas and ran to Bravo to pick up supplies so I could finish baking. Back to work with flour and buttermilk, at which point the dough began to take on a sour twang that cut nicely through the sugar. I slipped little teaspoons of dough onto my baking stone and let the oven work its magic. Meanwhile, I tried to decipher the icing instructions, which called for a box of 10x sugar (if this is a sugar brand, it is beyond me to know it) and an unspecified amount of an unspecified milk. 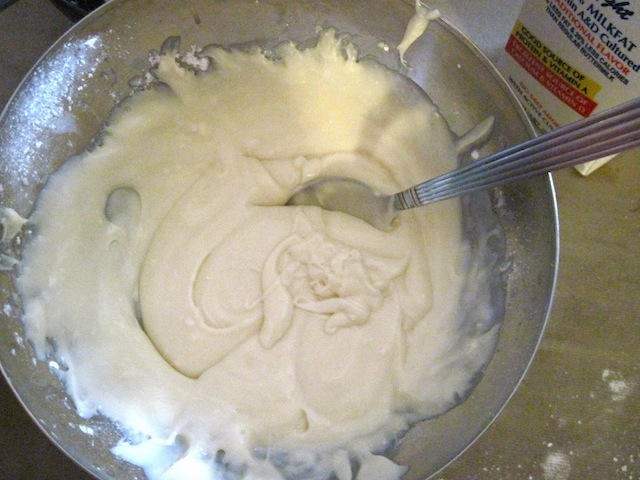 So I made up an icing recipe. Which I think was a success. When the cookies, like little muffin tops, came out of the oven, I drizzled them with my cream cheese and buttermilk icing and ate them hot. 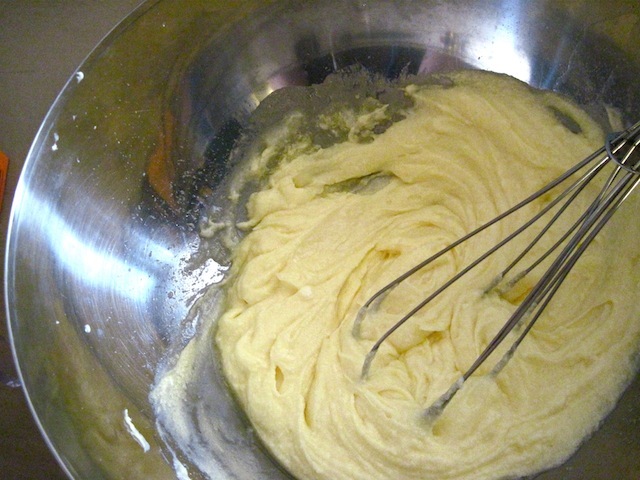 Cream sugar, butter, and eggs, then add flour baking soda and baking powder. Mix well. Slowly add buttermilk. Drop by teaspoonful and bake at 350 F for 10 minutes. Cool cookies on a rack and ice when cool. 10x is the number of times the sugar has been processed–which refers to powdered sugar in this case. And way to go for creaming butter and sugar by hand!